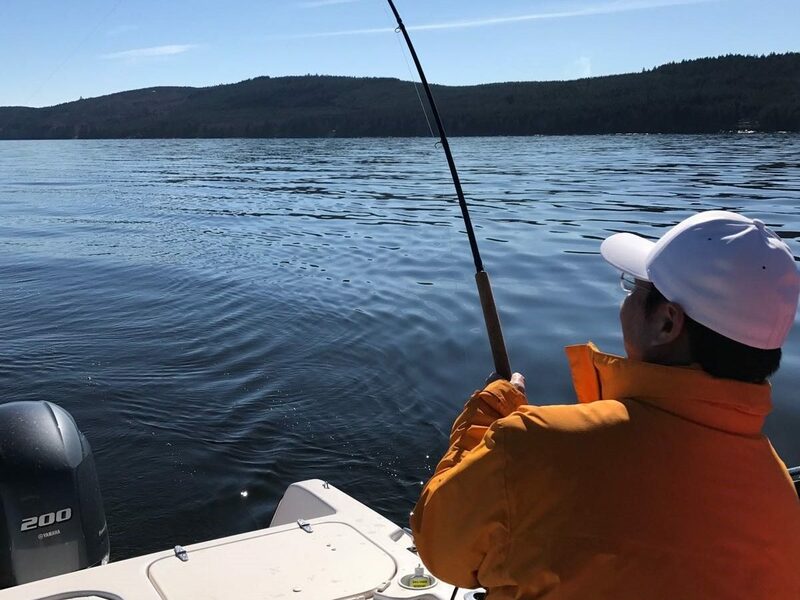 There was a lot going on this past week with water conditions, fish depth, and we also fished all over the place, including Lower Howe Sound, Bell Buoy, Thrasher, and Porlier. First lets start with the water conditions. This past week we saw a distinct change in the water colour. Gone are the days of the blue and clear water where you can see your flasher down to about 45 feet when you are dropping it down on the rigger. The algae bloom has started, and a bit early too, and with it we now have more of a tea coloured water. The same can be said over at Thrasher and Porlier as well. This does seem to affect the fishing, if only for a period of time until the fish adjust or move. The same thing happened last year, the water got dirty and the fishing seemed to really get tough, but eventually it does turn on again, but things are different when it does and by that I mean suspended fish. This is the time of year where we start to get fish mid water column and with the dirtier water it just seems the bait comes up a bit and the fish come up right along with it. Eddie and I both hit nice fish mid water column this past week and we started marking fish on the sonar mid water column more consistently as well. So much for just dropping both rods to the bottom, time to start paying more attention to where your gear is and time to start stacking to cover more depths. I marked suspended fish in Howe Sound, Bell, Thrasher, and Porlier this past week and actually got a few fish reeling in the gear. In general the fishing in Lower Howe Sound was tougher than it has been and this could be the transition into fish moving out to the Hump and QA area to feed on all the herring that show up there this time of year. That in conjunction with the algae bloom made for some slower days. Over on the other side we fished Thrasher and Porlier hard and we did mark a lot of chinook in both spots but they were clearly not on the bite for the most part. We did manage to hook up some nice fish after grinding hard for them, but there was a distinct slow down in the action from the previous week when we were marking the same amount of fish and bait but the water was clear. It might be time to move offshore out to “The Highway” in 300-1000 feet and see what is going on out there. Closer to home we did a little scouting off the Hump and there seems to be lots and lots of bait off the Hump, QA, and the Bell Buoy. We didn’t get any fish off the Hump, but there has been good action from the Bell all the way out to the QA these past few days. G-Force spoons in 3.0 and 3.5 have been good producers in the past week. For gear we have been using G-Force 3.0 and 3.5 spoons in Irish Cream, Trail Head, Trap Shack, and Outfitter. 3.5 Kingfisher spoons in Irish Cream, Cookies N Cream, and Homeland have also been good. The 3.5 and 4.0 are probably the way to go coming up, as the fish start feeding on larger, mature herring. 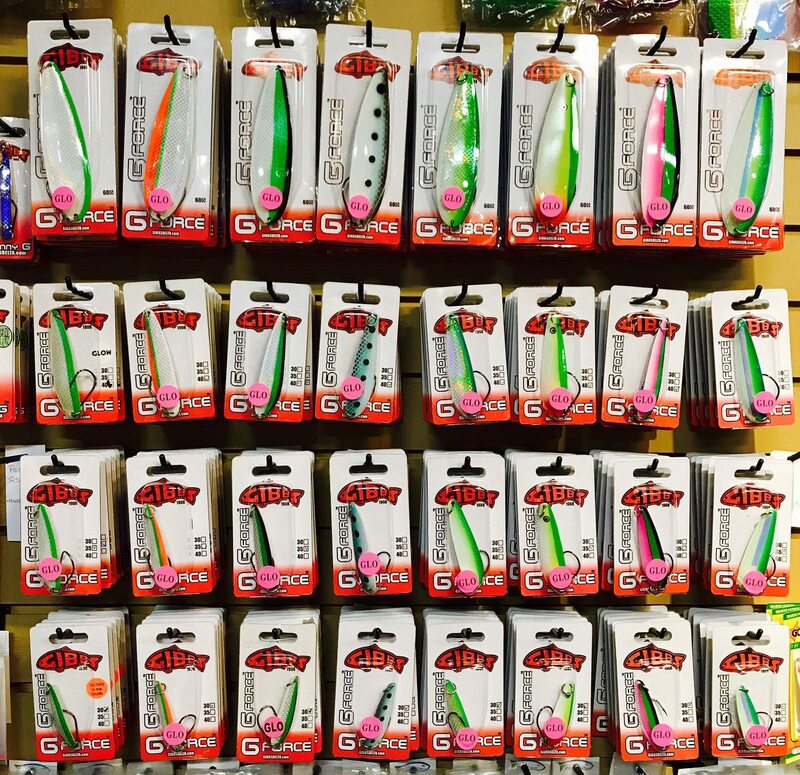 For flashers we have been using the Salty Dawg, Glow Green, and Glow Chartreuse, Green Onion Glow and UV Jelly Fish Yellow/ Gren Mist Kinetic with glow stripe. With the dirtier water the chartreuse and green flashers with glow have really turned on again.